Almighty God, who called your faithful servant Boniface to be a witness and martyr in the lands of Germany and Friesland, and by his labor and suffering raised up a people for your own possession: Pour forth your Holy Spirit upon your Church in every land, that by the service and sacrifice of many your holy Name may be glorified and your kingdom enlarged; through Jesus Christ our Lord, who lives and reigns with you and the Holy Spirit, one God, for ever and ever. 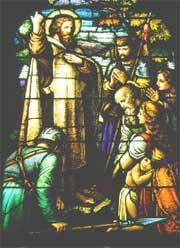 Wynfrith, nicknamed Boniface ("good deeds"), was born around 680 near Crediton in Devonshire, England. When he was five, he listened to some monks who were staying at his father's house. They had returned from a mission to the pagans on the continent, and Boniface was so impressed by them that he resolved to follow their example. Although his father had intended him for a secular career, he gave way to his son's entreaties and sent him at the age of seven to a monastery school. He eventually became director of the school at Nursling, in Winchester, where he wrote the first Latin grammar in England, and gave lectures that were widely copied and circulated. At thirty, he was ordained and set out to preach in Friesland (overlaps with modern Holland), whence he was soon expelled because of war between its heathen king and Charles Martel of France. Boniface, after a brief withdrawal, went into Hesse and Bavaria, having secured the support of the Pope and of Charles Martel for his work there. 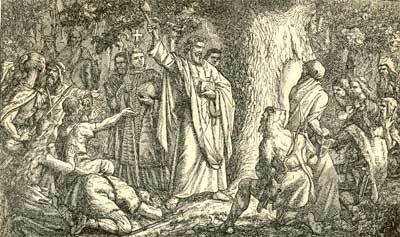 In Hesse, in the presence of a large crowd of pagans, he cut down the Sacred Oak of Geismar, a tree of immense age and girth, sacred to the god Thor. It is said that after only a few blows of his axe, the tree tottered and crashed to the ground, breaking into four pieces and revealing itself to be rotted away within. It was the beginning of a highly successful missionary effort, and the planting of a vigorous Christian church in Germany, where Boniface was eventually consecrated bishop. He asked the Christian Saxons of England to support his work among their kinsmen on the continent, and they responded with money, books, supplies, and above all, with a steady supply of monks to assist him in teaching and preaching. 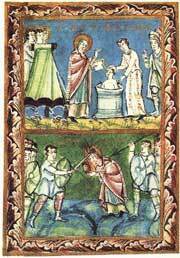 Boniface did not confine his attentions to Germany. He worked to establish cooperation between the Pope and others in Italy on the one hand and Charles and his successors in France on the other. He persuaded Carloman and Pepin, the sons of Charles, to call synods for the reform of the church in their territories, where under previous rulers bishoprics had often been sold to the highest bidder. He never forgot his initial failure in Friesland, and in old age resigned his bishopric and returned to work there. Many Frisians had been converted earlier by Willibrord (another Saxon missionary from England--see 7 Nov), but had lapsed after his death. Boniface preached among them with considerable success. On June 5, the eve of Pentecost, 754, he was preparing a group of Frisians for confirmation when they were attacked and killed by heathen warriors. The historian Christopher Dawson estimates that he has had a greater influence on the history of Europe than any other Englishman.